Caroline Gaynor is Triathlon Director for Team Red, White & Blue. Team RWB’s mission is to enrich the lives of America’s veterans by connecting veterans to their community through physical and social activity. 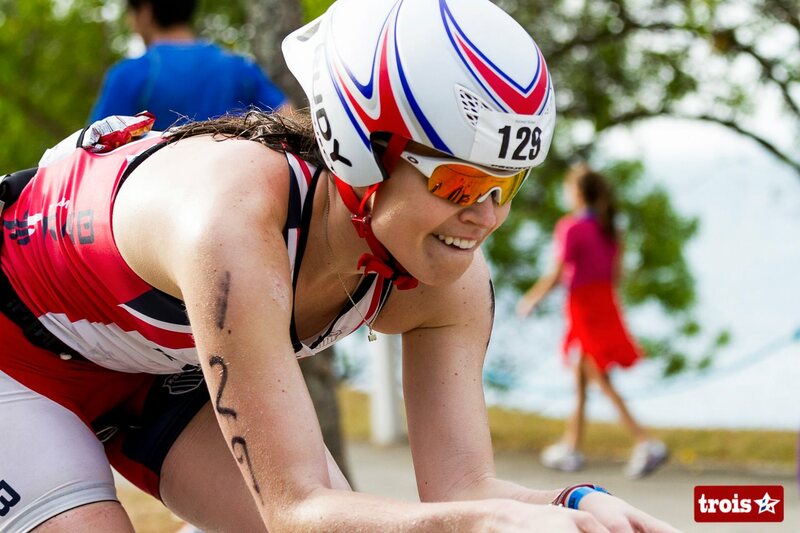 Caroline is responsible for the development of the triathlon team, including recruiting new members and initiating and maintaining relationships with the team’s sponsors. Caroline has been competing in triathlons since 2001 and is passionate about racing as a guide for visually impaired triathletes. 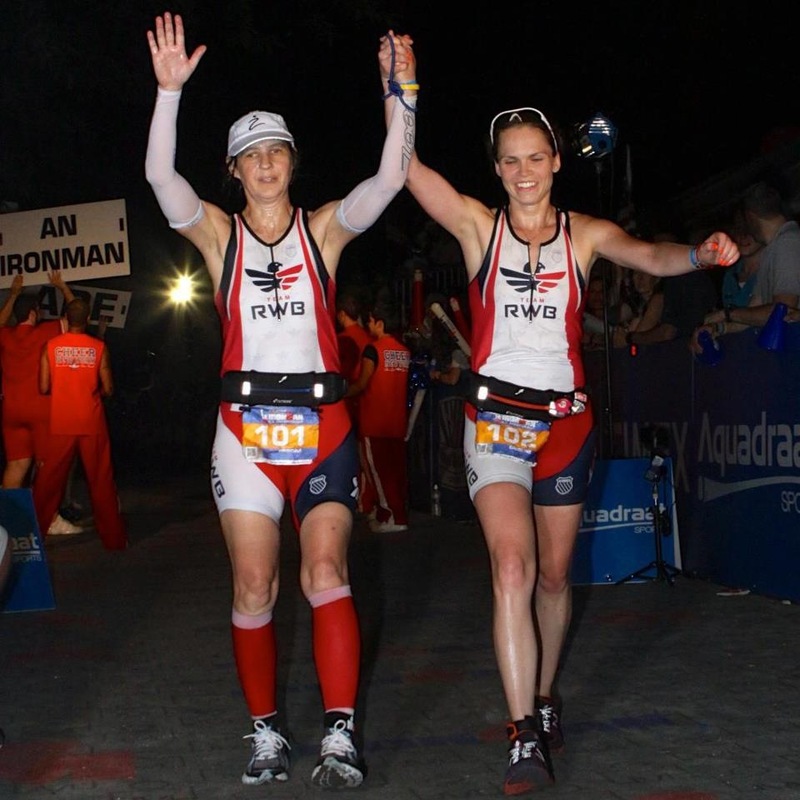 She has guided 3 Ironman triathlons and became a Race Across America finisher in 2012 as a member of Team RWB’s 4-man team. To learn more about Team RWB, please visit their website: www.teamrwb.org. 1. Number of Triathlons and/or Ironman races you have done? I have been racing since I was 17 years old (I’m 29 now), so I have done quite a few races. I believe I have completed well over 55 triathlons ranging from sprint to Ironman distance. I was a collegiate rower and have been competing in cycling events for a few years, both of which have reduced the number of tris in which I have participated. 2. Favorite Tri/Ironman or course? I don’t think I’m in a position to say which Ironman (or full distance) race is my favorite because I haven’t done enough of them. However, this will be my tenth consecutive year competing in the New York City Triathlon. It is definitely my favorite race. The fact that the race accommodates 7000+ athletes in such a densely populated city amazes me. Also, the race director promotes para-triathlon and encourages all para-athletes to participate, which I think is incredibly important. And who doesn’t love finishing a triathlon in the middle of Central Park? It’s a thrilling race. I never get tired of it! 3. Most memorable race? Why? My most memorable race would have to be Ironman Lake Placid in 2010. A friend emailed me five weeks before the race and informed me that there was a blind female triathlete who was trying to become the first blind female to complete an Ironman triathlon with a female guide. Unfortunately, the guide with whom the blind athlete (Patricia Walsh) had been training all year long fractured her wrist in a bike crash during training and couldn’t compete. Through a serendipitous email chain, my friend, Brian Gatens (who had no personal connection to Patricia), found out that a blind woman needed a female guide for Ironman Lake Placid. Brian knew that I had guided visually impaired athletes in a number of races, so he reached out to me. I emailed Patricia within minutes of receiving Brian’s message and committed to race with Patricia during our first conversation. I must preface this with the fact that I had only done one full distance triathlon, and that was in 2005. I was in good cycling shape and felt totally comfortable on a tandem, but I wasn’t training for triathlons at that time. My focus was bike racing during the spring of 2010, so I had put in very few running miles and zero time in the pool. But I felt confident enough in my fitness to know that I could guide an Ironman. Patricia flew to NYC from Seattle the week before the race- we met when she arrived at my apartment after coming straight from the airport! Our practice race was the NYC Triathlon. Though we were not pushing ourselves to the limit, Patricia still won the open para race. Just one week later, I found myself in Mirror Lake, guiding Patricia through a pack of 2000 triathletes in the two-loop IMLP swim. Patricia’s swim was a little rough because it felt like the crowd of swimmers never thinned out! The bike leg took a lot longer than I had anticipated. I had no idea how much climbing there was on the IMLP bike course! The last ten miles of each loop were straight uphill. Tandems aren’t the fastest bikes on the uphill, but they FLY on descents. So, after eight hours on the bike, we finally hit the run. I hadn’t run longer than two hours in five years and Patricia was an accomplished marathoner, so I was beyond nervous. Somehow, we pulled out a 4:30 marathon on a pretty challenging run course. Though our time wasn’t blazing fast (Patricia broke twelve hours at IM TX the following year with two Kona-qualified female guides), we accomplished her goal of becoming the first blind female athlete/female guide team to complete an Ironman. 4. What are your PR’s? My fastest Olympic distance Tri was just over 2:21. But that was at the NYC Tri, which has a notoriously fast swim, so I consider my true PR to be 2:28. My fastest half IM was 5:05, but again, that race had a pretty fast swim, so let’s call my PR 5:11. I went 5:11 in Timberman in 2007. I was proud of my performance in that race. 5. The only Running shoes, Bike, Wheels, Gear for me is/are? My road bike and Tri bike are Cervélos, and they’ve never let me down. I also love swimming in my XTerra wetsuit. Right now, I’m racing in New Balance racing flats and I think they’re fantastic. In road cycling races, I only ride Stan’s NoTubes wheels with Hutchinson tires. The wheels are amazing. My race belt of choice is iFitness, hands down. I have tried almost every race belt on the market and nothing compares to iFitness. The belts are made of Neoprene, so they’re water resistant. I hold most of my nutrition in my race belt and when I’m running, it doesn’t ride up like most race belts. As far as nutrition goes, I love Amrita Health Foods. Amrita’s products harness the inherent and incredible power of plants to heal your body, repair your health, and provide the strength, mental focus needed to perform at your best. All of their products use raw, vegan, high-alkaline protein made from sprouted brown rice, peas, cranberries, and hemp. I also just helped launch a new startup called EnduroPacks. EnduroPacks is offers a convenient, monthly subscription that provides endurance athletes with the vitamins and nutrients that are essential for peak performance. Our mission is to provide a service that simplifies this vital aspect of the complicated life of today’s endurance athlete. Each monthly pack contains products that cover the major building blocks of a complete sports nutrition regimen: Amino Acids, Electrolytes, Glutamine and Multivitamins. All of our products are FDA approved, gluten-free and contain NO GMO ingredients. We are offering a discount for people who sign up on our website. Here is an exclusive 20% discount for the readers of the C4 Athletics blog: C4TWENTY. Our product just launched. You can order your subscription at www.EnduroPacks.com today! If you want to hear more about our products and read our training trips, check out our Facebook page (https://www.facebook.com/EnduroPacks) or follow us on Twitter @EnduroPacks. 6. Are you a hot or cold weather athlete? I blow up in the heat. I am definitely a cold weather athlete. Heat is my kryptonite. This is yet another reason why I am excited about EnduroPacks. An electrolyte imbalance can severely impair performance- particularly in the heat. EnduroPacks’ electrolyte salt comes in a concentrated liquid spray. You simply add a few drops to your bottle of water and you’re good to go. This is the most efficient, convenient way to absorb the electrolytes your body demands as an endurance athlete. 7. When do you prefer to workout? Morning, afternoon or evening? 8. Have you ever DNF (Did Not Finish)? I DNFed at Ironman Arizona in 2011. 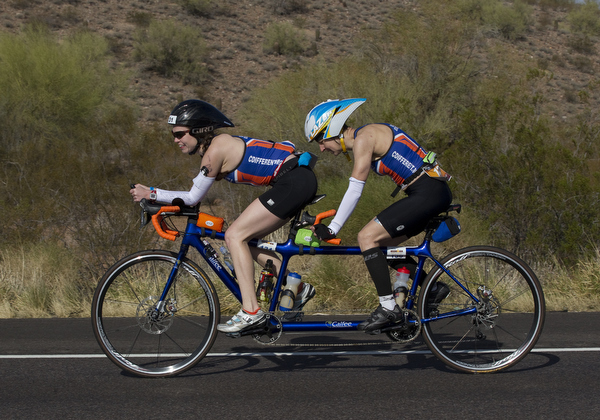 I raced Ironman Arizona as a guide for a visually impaired athlete. Her goal was to break 14 hours. I just wanted to make sure that I did not let her down. The athlete, Tina Ament, is a good friend of mine, and I was looking forward to racing with her. We were both hypothermic after the swim. The volunteers almost made us go to the medical tent. After warming up during a long transition, we made it out onto the bike and started off very strong. The first loop of the bike was right at Tina’s target pace. It was a three-loop course, and after the first loop the wind kicked up. We stayed strong and finish the bike around 6:45. When we started the run I felt okay, but early in the going, I noticed that my legs were cramping. This had never happened to me in a race before. I was petrified that I would slow Tina down and hurt her chances at racing a fourteen-hour Ironman. Thankfully, because Tina is such a good friend, she was very understanding and did not make me feel guilty about the fact that I had to take frequent walking breaks. Around mile twelve or thirteen, I started worrying about Tina’s safety. The race was in November, so it was already dark. My legs were cramping so badly I was worried that I would trip and fall, taking Tina down with me. As it happens, Tina belongs to an amazing triathlon team in Washington DC (Team Z), and we were fortunate that the team had a dozen members racing that day. In addition, they had even more spectators who were also athletes. At the point where I began to worry about Tina’s safety, I knew that I had to find a substitute guide. Obviously, that was easier said than done. I was devastated by the idea of having to not only DNF, but also to abandon a good friend in the middle of the most important race of her life. At the crucial moment, one of her teammates ran by. We explained the situation and he offered to guide her for a while. Tina’s pace was faster than her teammate’s, So Team Z’s spectators quickly found another guide to run the rest of the race with Tina. I walked another mile or two, sobbing like a baby. For a moment, I considered finishing the race on my own. I knew that I could walk the rest of the marathon and finish in well under 17 hours. But when I reached the Team Z tent, I remembered that this was not my race. I had nothing to prove. I was there to support Tina, in any way that I could. So I waited with her teammates as she continued to crush the Ironman course. Her coach suggested that I run across the finish line with her. I am glad that I was able to share the moment with her. Making the decision to drop out of the race was probably the hardest decision I’ve had to make in my entire triathlon career. But Tina finished the race in 14 hours! I witnessed the camaraderie and selflessness that exists in the sport. Were it not for Jackie McCarthy, who ran the final nine miles with Tina, we would have finished the race together. But we would not have finished strong. Tina achieved her goal that day, and I learned many great lessons. I was so proud of her performance, and so grateful to her teammates, that there was no way I could dwell on the negative feelings I had surrounding my performance in the race. For me, one of the greatest challenges of guiding is in remembering that I am human. I think of myself as a piece of equipment. Equipment can break. It can malfunction and be unreliable; as can human beings. I was physically unable to keep up with Tina during the marathon. I had to DNF the race. But it was still one of the most incredible experiences of my life. 9. What race would you like to forget? Why? I have never done a race that I would like to forget. No matter how bad a race is, I learn from every experience. In fact, the most difficult and frustrating races are often the ones that teach us the most about who we are as athletes. 10. Do you have any recommended resources to share (books, seminars, websites, coaches)? I have heard very good things about the beginner triathlete forum. Unfortunately I don’t have many resources to share because I tend to just absorb as much information as I can. Nowadays there are so many different websites, coaches, and books that it can be overwhelming. I think it is important to listen to others’ opinions, and then form your own from your experience as racing. There is no one right way to train for a race. 11. Have you experienced a breakthrough, and if so, what led to it? I am still waiting for my breakthrough! 12. What was the best advice you were ever given? A friend recently told me, Do not always believe what you think. This is wonderful advice because most athletes are very hard on themselves. I am certainly no exception. Having confidence in your abilities is crucial as an endurance athlete. 13. Do you have a saying or motto that you live your life by? I don’t have a saying or motto that I live by, but there are certain things that I believe are very important. I do not believe in regret. I think it is important to learn from every mistake you make, and even if you repeat the same mistake multiple times it’s never too late to get it right. 14. What tips would you give a group of athletes preparing for their first tri/Ironman? The most important thing is to approach the race as though it is something fun. The fact that we are able to race is a privilege. Of course, it is important to have a structured training plan, to get enough rest, and to focus on your nutrition plan, especially for longer races. But the most important thing of all is to approach each workout and race with gratitude for having the physical ability to complete a triathlon. 15. What’s your next goal? My next goal is to guide Rachel Weeks at Ironman Texas in May. My goal is to be as good a guide as I can possibly be and to get her across the finish line with smiles on both our faces. I am excited to race with Rachel because she is such a positive and motivational person. 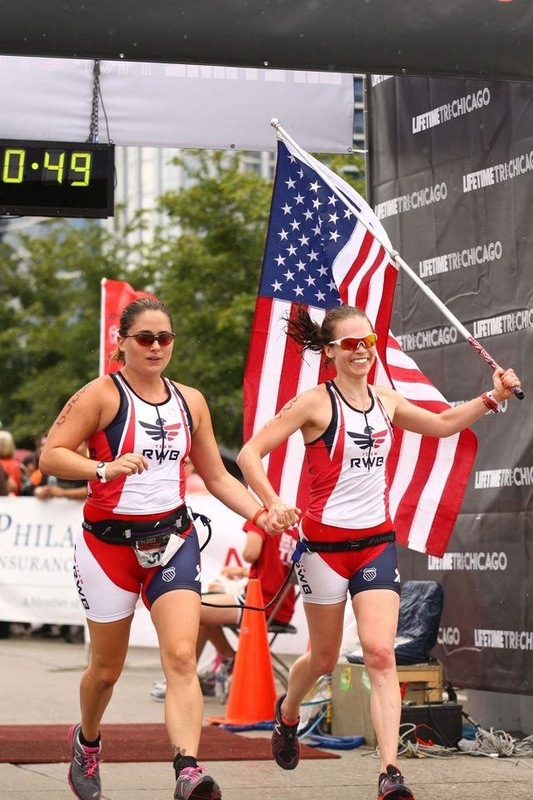 We raced the Chicago Triathlon together and I carried an American Flag for 5 miles of the 10K run in order to promote Team Red, White & Blue. The enthusiastic response we received from spectators and other racers was incredible. I can’t wait to rock the RWB Eagle at Ironman TX this May! Please feel free to follow Caroline through her Twitter, Blog and Tumblr accounts. This entry was posted in C4 Athlete, Running and tagged #C4Athletics, #F3Community, #FlagNor, #Flagnorfail, #gobigorgohome, #Instarunners, #Runaholics, #Runnerds, #RunThisYear, 13.1, 26.2, Athletic, C4 Athletics, Challenge, Chicago, Chicago Marathon, CM13, Cross Fit, Cycling, Endurance, F3, Fitfluential, Flag Nor Fail, go big or go home, Health, Ironman, Mamavation, Marathon, Nutrition, Paraathletes, Run, Running, social media, Team Red, Team RWB, Training, Triathlon, Virtual Challenge, White and Blue by @Abe_Cortes. Bookmark the permalink. What a great interview! I love Carolinie’s answer to the question about a race she’d like to forget. Such important words: “I have never done a race that I would like to forget. No matter how bad a race is, I learn from every experience. In fact, the most difficult and frustrating races are often the ones that teach us the most about who we are as athletes.” So true!